Home / Documenting Life • Scrapbooking / Love Saturdays…. We got up a little after 5:00 this morning so Mike could do some cleaning up outside (you have to when it is going to be well over 100 degrees). So I was able to get up and have a quiet Saturday morning with my coffee and computer before the kiddos got up. I worked on Operation Organize the House and cleaned out my bedroom drawers and bathroom cabinets, stuffing a huge bag full of clothes to give away and another with expired stuff to throw out. The rest of the day was spent doing exactly what I hoped…relaxing. I took a nap (a rarity for me anymore), scrapped a bit and planned my shopping list for the Studio Calico reveal tomorrow. 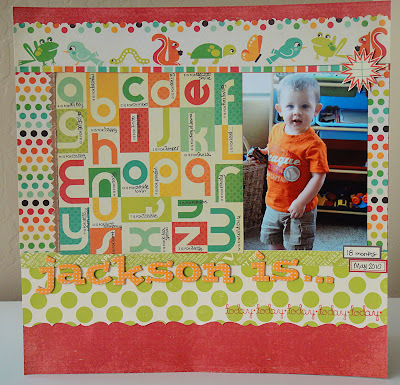 I did this layout using the Studio Calico Partly Sunny June kit/add-on’s plus an additional coordinating We R Memory Keepers paper. I had done a similar page about Nicholas a little while ago so I wanted to do an “alphabet journaling” page for Jackson, too. It worked great to do an 18 month page for him. I found this 6×6 alphabet section on the backside of the polka-dot WRMK paper and the page was born. And I love, love, love the stamps from this SC kit too. Salmon Pizza is baking in the oven and the boys are eating bagel cheese pizzas (because no matter what time we plan dinner they want to eat earlier.) Looking forward to some more scrapping tonight after the kiddos are in bed. Super cute–I love the mix of patterns. Hope you had a nice rest of your weekend. MelissaTX from Camp Scrap – stopped by to check out your blog. I love that cute layout – great colors!